Sieving is the process of separating particles by size. The process started in ancient times in Egypt where sieves were used to separate grain. Today there are high tech methods such as laser diffraction and image analysis used to determine particle size distribution. Other methods such centrifuge techniques and sedimentation are also used. 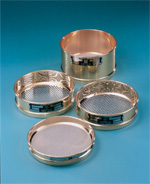 However, sieves are the most commonly used devices for particle size analysis. The sieving process is comparatively inexpensive, simple in concept and easy to use. Special construction for specific sieve shakers and/or applications. How May We Help with Your Sieving Needs? We offer CSC Test Sieves, built in conformance to ASTM standards, for a full range of mesh sizes in 8 inch and 12 inch diameter frames. We understand that there is a need for continuity in quality management systems. Consequently, CSC continues to supply the Endecotts range of Calibrated Sieves. A mid-point sieve has had the mesh inspected. The sieve is then selected as a mid-point if the results give tolerances that are in the middle of the ASTM standard. The predominant application for mid-point sieves is as master stack.